May is Celiac Awareness Month, so it is only natural that Van's is hosting a giveaway! Up for grabs are some really great prizes, starting with a $100 Visa Gift Card! Van’s is a leader in wholesome new snacks, sure to satisfy the kid in everyone! Kick off summer with two new snack bars (Banana Bread and Gramwich- a chocolate stuffed graham cracker sandwich) and Soft-Baked Whole Grain Granola Clusters in Double Chocolate and Banana Nut. These sound amazing! Soft-Baked Whole Grain Granola Clusters are great for recipes. Melanie at Nutritious Eats went one step farther than enjoying out of the bag. 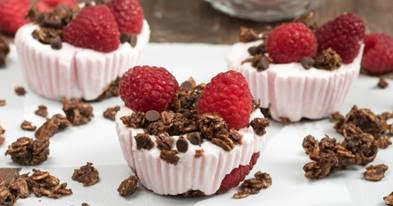 She created Chocolate Raspberry Frozen Yogurt Bites. Total Yumm!!! Hop up and make these delicious treats! While they are setting in the freezer, come back and enter the giveaway! Disclosure: Sweet Cheeks Adventures teamed up with Van's for this giveaway. This giveaway is in no way associated with Facebook, Twitter, or Pinterest. The winner will be chose at random by the Giveaway Tool and emailed.